Progressive Field is the site of the matchup between the Kansas City Royals and the Cleveland Indians on Saturday, May 27, 2017. The probable starting pitchers are Jason Vargas for the Royals and Danny Salazar for the Indians. Kansas City opens at +166 while Cleveland opens at -176. The Royals have a 16-28-2 over/under record and a 20-26-0 run line mark. The Indians are 15-30-0 against the run line and have a 16-26-3 over/under record. The Royals have a 19-27 overall record this season. Starting pitcher Jason Vargas has a 5-3 record with an earned run average of 2.30 and a WHIP of 1.04. He has 49 strikeouts over his 54.2 innings pitched and he's given up 44 hits. He allows 7.2 hits per 9 innings and he has a FIP of 2.96. The bullpen has an earned run average of 4.78 and they have given up 146 base hits on the year. Teams are hitting .249 against the bullpen and they've struck out 143 hitters and walked 75 batters. As a team, Kansas City allows 8.6 hits per nine innings while striking out 8.1 batters per nine innings. They are 16th in the league in team earned run average at 4.19. The Royals pitchers collectively have given up 393 base hits and 192 earned runs. They have allowed 51 home runs this season, ranking them 24th in the league. Kansas City as a pitching staff has walked 166 batters and struck out 372. They have walked 3.6 men per 9 innings while striking out 8.1 per 9. They have a team WHIP of 1.36 and their FIP as a unit is 4.14. As a team Kansas City is hitting .227, good for 29th in the league. The Royals hold a .367 team slugging percentage and an on-base percentage of .288, which is good for 29th in baseball. They rank 29th in MLB with 7.5 hits per game. Salvador Perez is hitting .280 with an on-base percentage of .318. He has 45 hits this season in 161 at bats with 28 runs batted in. He has a slugging percentage of .528 and an OPS+ of 124. Lorenzo Cain is hitting .259 this year and he has an on-base percentage of .353. He has totaled 42 hits and he has driven in 10 men in 162 at bats. His OPS+ is 94 while his slugging percentage is at .358. The Royals have 347 hits, including 53 doubles and 52 home runs. Kansas City has walked 118 times so far this season and they have struck out 351 times as a unit. They have left 286 men on base and have a team OPS of .655. They score 3.33 runs per contest and have scored a total of 153 runs this year. Cleveland has a 24-21 overall mark this year. With an earned run average of 5.55, Danny Salazar has a 3-4 record and a 1.53 WHIP. He has 69 strikeouts over the 47 innings he's pitched. He's also given up 49 hits. He allows 9.4 hits per nine innings and his FIP stands at 4.73. The bullpen has an earned run average of 2.19 and they have given up 105 base hits on the year. Teams are hitting .205 against the Indians bullpen. Their relievers have struck out 160 batters and walked 51 opposing hitters. 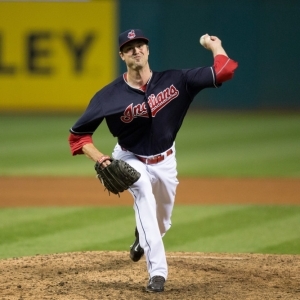 As a team, Cleveland allows 8 hits per nine innings while striking out 10 batters per nine innings. They are 10th in the league in team earned run average at 3.99. The Indians pitchers as a team have surrendered 353 base knocks and 176 earned runs this season. They have given up 52 home runs this year, which ranks 21st in Major League Baseball. Cleveland as a staff has walked 135 hitters and struck out 441 batters. They give up a walk 3.1 times per 9 innings while they strike out 10 per 9. Their team WHIP is 1.23 while their FIP as a staff is 3.62. As a team, they are batting .242, good for 21st in the league. The Indians hold a .413 team slugging percentage and an on-base percentage of .322, which is good for 17th in baseball. They rank 23rd in MLB with 8.1 hits per contest. Michael Brantley comes into this matchup batting .290 with an OBP of .364. He has 42 hits this year along with 19 RBI in 145 AB's. He maintains a slugging percentage of .455 with an OPS+ of 114. Francisco Lindor is hitting .274 this season and he has an OBP of .337. He has collected 49 hits in 179 at bats while driving in 22 runs. He has an OPS+ of 122 and a slugging percentage of .525. The Indians as a unit have 363 base hits, including 83 doubles and 53 homers. Cleveland has walked 167 times this year and they have struck out on 342 occasions. They have had 312 men left on base and have an OPS of .735. They have scored 4.36 runs per game and totaled 196 runs this season.